“The Wave” across seven Saturdays…. It’s sometimes hard for a 2 year old to wait patiently, but Reid was doing exactly that, in the arms of his father, Bill, and with his mom, Megan, standing right there. He waited with the other kids, some were in wheelchairs and others stood with the help from an adult. Then … the first quarter came to a close between Purdue and Iowa. “Time to wave!” someone shouted. It was the final home game of the season for the Hawkeyes, and consequently, the last wave of the year. It has quickly become one of the best college football traditions. You’ve probably seen video or stories about this by now. 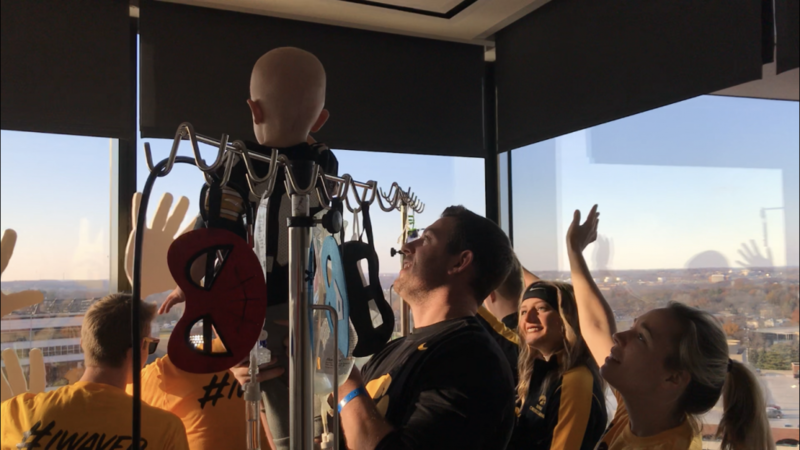 At the end of the first quarter for an Iowa home football game, the entire stadium, and now both football teams – the players and coaches, the officials on the field, the pressbox and folks in the suites … EVERYONE … turns to look up to the 12th floor of the Children’s Hospital to wave to the kids looking down at the stadium. And those children, who are patients at the hospital, look out the window to wave back. For me, it was impactful to see how much the tradition had grown over seven home Saturdays. Our football crew, only by chance, had gotten the unique opportunity to cover the very first wave … and now the very last one of the year. Back in week one, when Iowa was taking on Wyoming, we really couldn’t anticipate how big this story would become throughout the year. No one could. On that September 2nd afternoon, it was mostly the fans in the stands who took part. I stood on the field that day, and noticed that some knew exactly what to do. Others did not, and seemed to take a cue from their neighbor. Most of the players and coaches on the field, especially on the Wyoming visitors sideline, continued to gameplan, though they took glances around the stadium. It was all new, and unique and different, and a surprise to some. Here is what aired during the game. Minutes, then hours later, social media had taken that same video to a bigger audience. Five home weekends inbetween week one and this past weekend – and suddenly, the nice gesture has become a nationally-known tradition. It doesn’t matter if Urban Meyer is engrossed in a possible upset, he stopped everything on the sideline a few weeks ago, to turn and wave. When Iowa went to East Lansing to play at Michigan State, the fans at Spartan Stadium waved at the end of the first quarter, even though the game wasn’t in Iowa City. From a week one moment of uncertainty and novelty, six home games later … everyone took part. The fans waved. Iowa players and coaches waved. The Purdue sideline waved. The officials waved. The media waved. Everyone waved. Here it is. I stood inside that hospital and watched, with tears forming in my eyes. Bill Gleeson lifted Reid up high, so the little guy could have a great view of the stadium down below. It’s now a few days removed, and I walked into another children’s hospital in Chicago on Monday. I live right downtown, and when my schedule allows for it, I volunteer at Lurie Children’s Hospital. Ironically, a little boy walked into the playroom where I was at, donning an Iowa Hawkeyes winter hat. “You were at the football game?” his mother asked as she walked into the room. “So were we! We traveled there for the wave. I wanted to take him,” she added nodding to her son. We proceeded to share our videos. I showed her mine from inside the hospital, she showed me hers from inside Kinnick Stadium, just a few rows up from the field. I watched the video as her son looks up at that 12th floor window, and waves to the kids who are going through so many similar things as he is right now. It gave me chills to watch our two videos together, and to think of her making the trip so her son could experience it all. It also made me realize that this is how far we’ve come since week one. Across seven Saturdays … it has grown from a suggestion on Facebook, to a trial test in September, to a tradition in November. 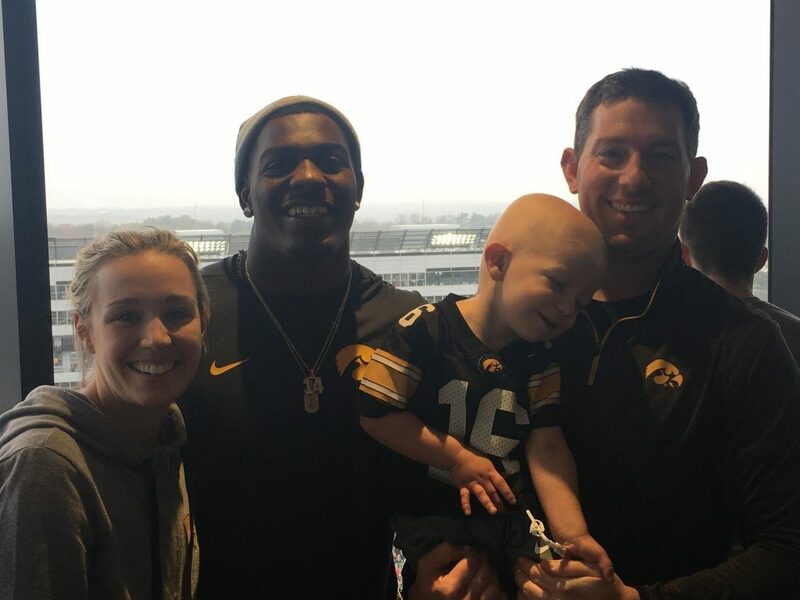 It is now an experience for that little boy who made the trip from Chicago and sat in the stands, and for little Reid who was in his father’s arms on the 12th floor. And it’s a reminder to the rest of us, to pause in whatever we are doing, and salute those true fighters who don’t wear a helmet or shoulder pads. Seven Saturdays and counting … one collective wave at a time.